After a few days in Busan and a few visits to some delicious fish restaurants, yesterday I was ready for something a little bit more land based. So I found myself on the doorstep of a small restaurant just up the hill from Gwangalli beach. 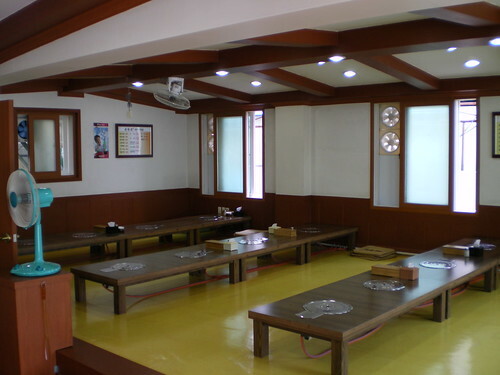 This ordinary looking place has a very small menu offering you the choice of 돼지국밥 (Pork soup), 수육 (Steamed pork) and 순대 (Blood sausage), as well as other variations based on those three dishes. 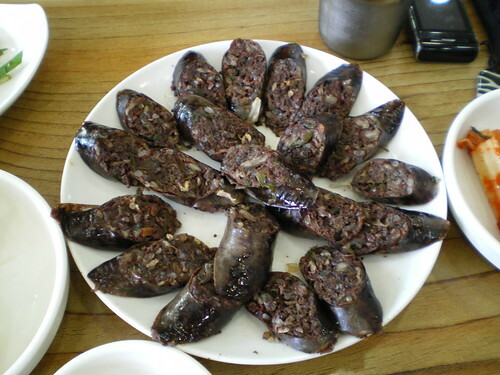 I went for the pork soup for 5,000 won and a plate of blood sausage for 7,000 won. 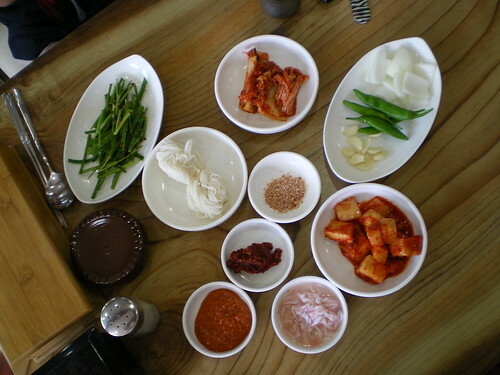 Side dishes are fairly minimal, but you get a good selection of sauces to mix into the soup or dunk your sausage into. The sausage itself wasn't beautifully presented, but it may well be the best I've had in Korea. I'm often disappointed with blood sausage as it leaves me with a dry mouth and a longing for black pudding, but these tasty black tubes were full blooded meaty delights. In texture and taste they felt more like a traditional banger and were perfectly seasoned. Busan maybe famous for its fish, but if you find yourself in the area then it's worth your while checking out the meatier side of Gyungsan-do cuisine. 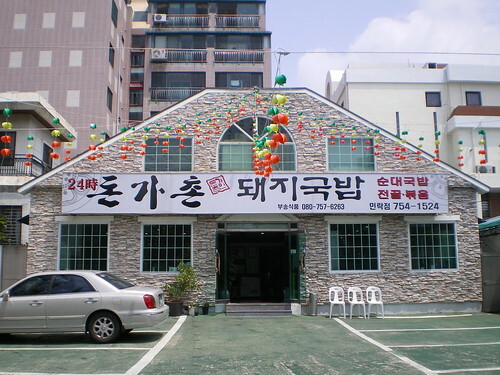 돈가촌 (Dongachon) is open 24 hours a day and can be found just a few doors down from the entrance to the MBC broadcasting complex up the hill from Gwangalli beach. You can call them on 051 754 1524. 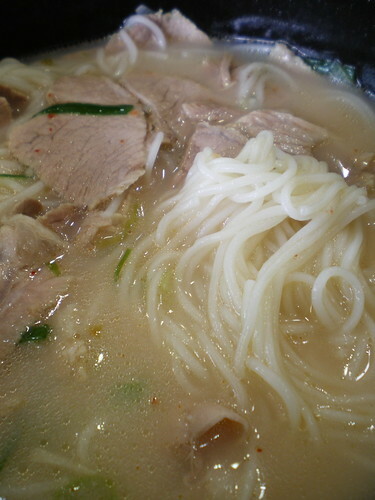 I see some striking similarities with Hakata ramen from Busan's neighbor across the strait. I agree. One difference may be in the noodles (the ones I put in my bowl were just the regular thin noodles you might find in 전치국수 rather than the harder Hakata noodles), but the concept is certainly similar. Now I need to head over to Fukuoka and try some Hakata ramen for myself! Hi!impressed with amazing pictures! jealous!, btw 'Soon-Dae' from some street venders are instant and not traditional korean version. 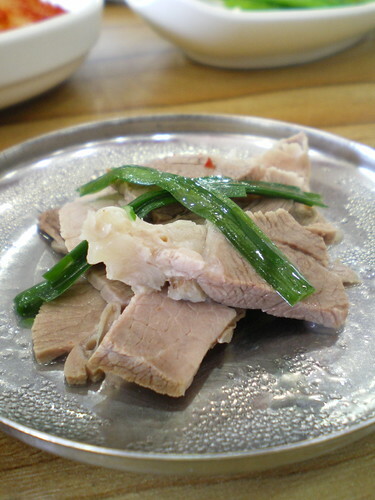 I prefer "Byong-Cheon Soon Dae" so much better and you can find some soon-dae soup as well.